Every year my parents make green bean casserole for Thanksgiving. It doesn't sound all that appetizing, but the french fried onions make it taste great. I took this picture with a Sony Cyber-shot DSC-HX1. The kitchen and oven lights are the two main light sources in this picture. As you can imagine, cooking for Thanksgiving is a stressful time in any household. Let's just say my mom wasn't too happy when I "let all the heat out of the oven" to photograph her green bean casserole. 1. In large bowl, stir together green beans and cream of mushroom soup. 2. Bake for 30 minutes in the preheated oven or until edges begin to bubble. 3. 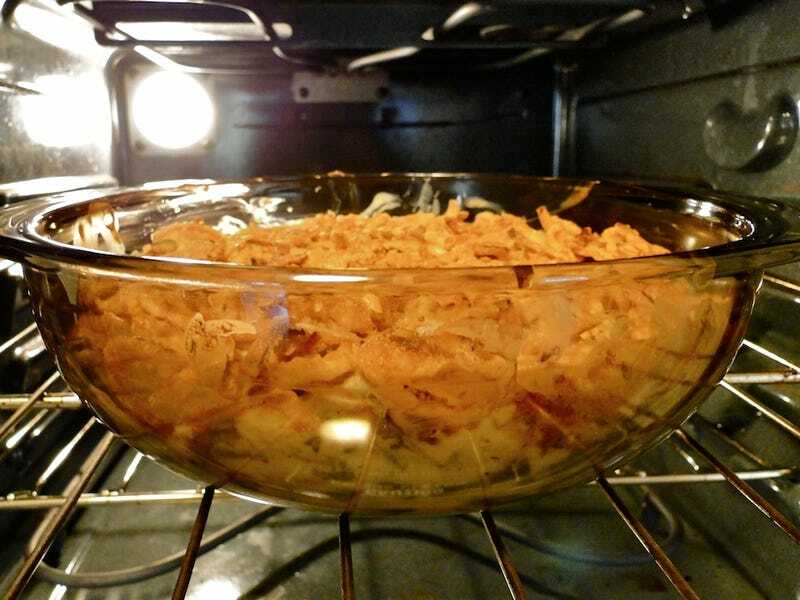 Cover with French's French Fried Onions and bake for another 5 minutes. My family's most interesting Thanksgiving dish was the turkey, but not that turkey. These sweet little gobblers were a hit. Candy corn for the tail detail, face, and feet. Chocolate Fudge Cake frosting held it all together. Shot with a Canon EOS REBEL T1i in Close Up mode. I photographed this sixteen pound turkey right out of the oven as it was resting. I used three external flashes, which kinda made it look like the bird just came out of the tanning booth. After separating the fat from the drippings, I just had to spill the flour and make the lumpiest gravy you ever seen. My friends and I have this tradition of celebrating our own made-up holiday,"Second Thanksgiving", the Saturday after Thanksgiving day. My friend Elizabeth prepares this incredible Thanksgiving feast (we talk about it literally all year) and the rest of us bring either drinks or dessert to go with Elizabeth's food. It's one of my favorite days of the year. I call this photo "Emergency" cookies because they were a plan "B" after I kinda ruined my original dish (a Venezuelan flan with rum called 'quesillo') around 3AM the day of the party. The photo itself shows the post-war environment of my "very-limited-counter-space" kitchen, with the cookies about to be put in a jar. I liked how the cookies look like they're baking (or tanning?) in the morning sun, and also seem so organized in the middle of this war zone chaos. Needless to say, I did not share this photo with the Second Thanksgiving guests... they only saw the nicely arranged tray. Preheat oven to 350 degrees. Mix flour, baking soda and salt; set aside. Mix together the butter and sugar until light and fluffy. Beat in the egg, then stir in the vanilla. Mix in the dry ingredients until well blended. My aunt always makes three marshmallow dishes for Thanksgiving. One marshmallow dish with yams and peaches, one marshmallow dish with sweet potatoes, and one marshmallow dish with just marshmallows. Usually the younger kids of the family eat just the plain marshmallow dish. I who am 21 have always eaten the plain marshmallow dish until this year. This year was a monumental year. I graduated to the marshmallow dish with the sweet potatoes. It was so good I am upset with myself that I haven't tried this before. The recipe for the dish is the following: 5 sweet potatoes, peeled and sliced. 1/2 cup packed brown sugar. 1/4 low fat margarine. 2 tablespoons orange juice. 1(10.5 ounce) package miniature marshmallows. Preheat the oven to 350 degrees F. Boil sliced sweet potatoes in water untold tender and drain. In a large bowl, blend the potatoes until creamy. Stir in the butter, brown sugar, orange juice to taste and a dash of ground cinnamon. Spread the sweet potato mixture into a 9X13 inch pan. Sprinkle the miniature marshmallows over the top and back at 350 until golden brown. Then enjoy! This photo was taken with the iPhone 4s. Well, this yummy apple pie started to smile and wink after the first few cuts so I had to run for the camera before it vanished. It was a perfect finish to a delicious Tofurky surrounded and cooked together with sweet potatoes, onions, celery and served with stuffing, coleslaw and cranberries for the enlightened side of the family. The unenlightened side went for a reportedly delicious Bird that had been soaked many hours in a brine and served with stuffing, brussel sprouts and various salads. The sausage balls originally served by my grandmother on Christmas Eve have become so popular that we now serve them on Thanksgiving as well. They rarely last for more than a few minutes! Mix all ingredients, adding just enough water to hold together. Bake on cookie sheet, 350 degrees for 15-20 minutes. Details: Nikon D90 with 18-200mm lens @ 38mm, 200 ISO, 1/60 @ f/4.2, pop flash, stick for holding back hungry relatives (optional). We had a very traditional Thanksgiving meal this year, but everything turned out excellent. Oven baked turkey, Stovetop stuffing (baked separately from the turkey and with dried apples added for flavor), real mashed potatoes and gravy from the turkey juices and extra bits. The rolls are made from scratch using the BH&G dinner roll recipe and brushed on butter. The pies were all made from scratch as well, including two pumpkin and one lemon meringue. My Mom says the best desserts are never cooked they are chilled, so that's why I made Oreo Truffles this year. They turned out well but were a bit to large. Next time I will make them about half the size. Chill in the refrigerator for at least an hour or even better, overnight. Cook and stir celery and onion in butter in a pan until tender, remove from heat. Mix remaining ingredients in large bowl. Pour butter mixture over bread mixture, let sit. Heat before serving. I took this photo with a Nikon D3000, f 3.5, 1/30 exposure. The shot was taken right after I finished making the stuffing, which has been my sole responsibility to make every Thanksgiving since I can remember. No matter who we eat with or where we go, this stuffing is at Thanksgiving dinner, and is often cited as the best part of the meal (by people other than myself, of course). Right after the turkey cooks for 5 hours, it comes out all steamy and juicy ready to be eaten. Shot with a Sony Alpha a230 at an ISO of 100. Story: This shot was inspired by more personal details, rather than an elaborate recipe or anything like that. To any normal person, this might just look like a boiling pot of sliced potatoes, but to me, there's so much more. My grandpa passed away when I was about 10 years old, 7 years ago, and he always used to let me help with the slicing and peeling of all the fruits and vegetables. I never really helped prepare any part of the thanksgiving meal after that, but this year, I just so happened to be in the kitchen when my step-mom wanted help cutting and boiling the potatoes. As I was slicing them, all I could think about was how maybe he was watching over me as I almost 'graduated' from his "cooking classes". As I was plopping the potatoes into the boiling water, it reminded me about the fact that when I was younger he wouldn't let me do this, because he didn't want the boiling water to splash onto me. So when I put the potatoes in the steaming pot, I just felt a strong sense of accomplishment, and that inspired the deep meaning behind this shot. Thank you for reading this! My family's Thanksgiving food tradition has more to do with the leftovers than the main course. Every year my dad uses the leftover turkey meat to make turkey pot pies. Our family fights over who gets to take a pot pie home with them—that's how delicious they are. This photo was taken before the strips of crusts were added to the tops with a Canon EOS Digital Rebel, EF-S 18-55mm lens, 1/25 exposure, f4.5. Melt butter in large soup pot. Mince garlic and cook in butter for 30 seconds. Add all veggies except peas. Cook veggies till they are starting to soften. Add both soups and bring to a boil (you can add a little milk if needed). Add turkey, peas, thyme, salt and pepper. Cook at a slow boil for 20 minutes. Add to pie crusts and top with strips of crust. Bake at 350 for 1 hour or until filling starts to bubble. After taking a number of shots of my grandma's world famous apple crisp, I decided that no matter the lighting or presentation, the food would look horrible. I switched my subject to my grandma's world famous rolls instead. These rolls are my favorite Thanksgiving food. Sadly, my family was unable to get the exact recipe from my grandma before her Alzheimer's had erased it from memory. Still, my cousin David tries every year to recreate the rolls. They are not the quite same but come in as a great runner up. Sunlight was pouring through my kitchen window and I wanted to try a shot not normally seen of food. I adjusted the aperture so I could black out the background and caught what I think looks like a sunrise over "roll"ing hills. Specs first... Sony A230 with 18-55mm lense. f/5, 1/20 , ISO-400, and natural light. My parents came up from Puerto Rico for the holiday and this is one of the plates my mother prepared me during Thanksgiving. What you see here is Avocado (that mom brought from PR), home made salsa, pepper jack cheese and what we call "Pasteles" in PR. The pastel here is what really makes this a special dish. Pasteles is a dish from Indigenous origins on the Latin community. It starts with pork being diced and cooked as a stew. Then a "masa" is prepared out of grated "Yautia"(also known as taro, malanga) and seasoned with the liquid from the meat, some milk, and oil that has been boiled on annatto seeds and a pinch of salt. The dough is then placed on a piece of banana tree leaves, that has already been soften over the flame of the stove prior. A small amount of the pork is placed in the dough and you then cover the meat with some of the actual dough surrounding. The leave is then folded and tied with strings from palm trees. This is then boiled on water for 40 minutes. More info can be found with a quick google search for "Puerto Rico Pasteles". These are our family-recipe Pecan Rolls, just outta the oven. Taken with my HTC Incredible 2, uploaded to Google+, where I was able to adjust the white balance so they look more natural, naturally. classic colors, that just bring the thought of thanksgiving into mind. mixed with the cranberries inside. out when the birds ready and enjoy a little taste of heaven. the story behind the shot, I was making my first cranberry sauce, and i noticed how beautiful the sugar crystals looked upon the cranberries, and i had to take a picture. The shot originally had the whole pan of berries, and eventually was cropped down to this beautiful segment. Editing wise, not much was done. It had exposure, highlights, shadows, contrast, and levels adjusted, pretty much and overall basic editing to make the colors and textures really pop. The story behind, this is only my second thanksgiving i've spent away from my parents, and every family has their classic traditions. This year i felt it was time to start my own, so i stated and adventure of cranberry sauce. This is definitely not the classic cranberry sauce or traditional really at all. Instead it has an initial sweetness, and then a spiciness after from the cinnamon. Its unique, as is a lot of things i cook. It was necessarily my favorite for putting over the turkey, and that wasn't my goal... it was the left overs. You can only have turkey and gravy so many times before it gets old. So, this can be used on as a spread for hot turkey sandwiches, or cold turkey sandwiches. It can also be used for potato pancakes which is what i always had the next day after thanksgiving. This dish is the start of a new tradition, it was really fun to make, and experience all the different flavors it has while it's cooking. The recipe is simple. One grahmcracker crust, vanilla pudding, and chocolate chips. Mix the vanilla pudding. If using cooked pudding, allow it to cool before mixing in the chocolate chips. If using instant pudding, mix in the choclolate chips once the pudding thickens. Pour the mixture into the pie crust and stick in the fridge to thicken. Serve will cool whip or whipped cream. My name is Kent Ring. Me and my brother were messing around having fun with my camera and then we decides to put the lens of my camera at the bottom of his cosmopolitan and then have him look in to the glass. I was surprised how the picture came out and decided to send it to this weeks competition. I thought this picture came out much better than the others of the other thanksgiving dishes. and somehow never makes it to the table til 4:00. Then we just sit around and laugh about growing up. reserved for special occasions due to the long prep time. smaller. The tighter the wrap is all the better. are golden brown all over. Let them cool and they are good to go! Back in Bleck chopped bones and spread in the oven at 200 ° C in 30 min until golden brown all around. Remove from oven and allow to drain. Chicken broth in saucepan, put in pork shoulder with rind side down, add bones and at 140 ° C for 1 hour in the oven. Remove the meat and the rind at a distance of 1 cm carve crosswise. Powdered sugar in large saucepan over medium heat, caramelize. Add the tomato puree, fry briefly and deglaze with beer and simmer and boil down a little liqueur-like. Now give meat with rind on top of it. Celery, carrots and shallots coarsely cut, or cut into sticks, do so. And it turned potatoes in the oven at 150 - 160 ° C for 30 min to cook. Then, ginger, cumin, bay leaves, marjoram and garlic cloves to branch and cook another 60 minutes in the oven. Bone to pick out, cut meat into slices. I keep meaning to enter one of these, and I actually saw the post about the contest in time for this one. Using my aging, yet still spry Nikon D80 and a 28-80 lens I picked up for a steal, I set it to 15/F5.6 and due to the terrible lighting in my kitchen and my desire to eat rather than set up my tripod, I used the flash. I've been shooting RAW for some other stuff, so I just left it on that. I tweaked the color and did the b/w masking in Photoshop to play down all the crap on the counter in the background. This is my husband dishing up our super tasty Stuffed Pork Loin. We started making this a couple of years ago when we, in almost 10 years of coupledom finally had a holiday where we couldn't visit family (we're Seattle, the closest is Sacremento). We didn't want to do the whole traditional thing since it's just the two of us. We make a stuffed pork chop that's also super tasty, so we thought- why not adapt it? This is completely our own creation, with only guidance from other recipies on cooking time and stuff like that. We've had some misses in the several times we've made it- we once forgot to salt and pepper the meat, but it was still darn tasty. Since it's an original creation, there really isn't a specific recipe, just kind of eyeballing, smelling and tasting. Take 1 pork loin, about 1 or 1.25 pounds for 2 people and split lengthwise, but not all the way through. Spread open and flatten by pounding (fist works fine- it was driving the dogs nuts- they thought there was someone at the door) until even thinness. Salt and pepper the inside of the meat and spread with butter mixture. For the butter mixture, take about 4 tablespoons of butter, cut into small pieces and put into chopperator (mini cuisanart chopper) with 3 slices proscuitto (from one of the pre-sliced packages), and 1/4 cup-ish of dried cranberries, dried apricots, and toasted pecans (or whatever nut you prefer). Also add 2 sprigs fresh rosemary and thyme (pulled off the stems, of course). Chop until well mixed and spread on the inside of the meat. Roll the meat tight with stuffing inside and tie with butcher's twine. Put a little olive oil on the outside and salt and pepper all around. Sear in a large pan on med-high for about 3 minutes per side, depending on thickness of meat- if it's smaller, do 2 minutes per side. Put in roasting pan- on rack- into 400 degree oven for 20 minutes or so (or until it hits whatever temp pork is supposed to, we guess). Let it rest for about 10 minutes, slice and enjoy. The sweet potatoes are simply diced and tossed with olive oil, salt, pepper, chopped fresh garlic and rosemary, and diced pancetta. They get roasted in the same oven for about 30 minutes, or until soft and cooked through. Times nicely if they go in while meat is being prepared. We did salads this year, but in the past we've done grilled green beans- just toss with oil, salt and pepper and grill for 6-8 minutes (until tender), turning often. This is my homemade Pumpkin Pie that I make for my family and I every Thanksgiving. It's one can of pumpkin guts, one can of evaporated milk, sugar, salt, pumpkin pie spice, and cinnamon sugar. I shot this on my Nikon D5000 with a 35mm f/1.8G, under regular kitchen lighting on my granite countertops. Settings were 1/50th of a second, ISO 800, and f/2.8. Thanks! Preheat oven to 375. Spread semi-sweet chocolate chips along bottom of pie shell (that's already in a pie tin of course). Then do the same with the pecans, over the chocolate chips. Mix remaining ingredients by hand in mixing bowl. Pour in mixed ingredients, causing the pecans to float to top. Tent the crust of the pie shell with foil (or pie protector) to keep crust from burning. Place in oven. After 20 mins, remove foil along crust. Bake for another 20-25 mins or until crust is golden. Place pie on wire rack and let it cool completely! DIG IN! Prepare and bake pie shell. Soften gelatin in water. Combine cranberries and gelatin. Bring to boil, simmer 5 minutes, stirring often. Cool. Beat egg whites until stiff, add 1 cup sugar, lemon juice, salt and cranberry mix. Beat until mixture holds firm peaks, 6 to 8 minutes. Pile into pie shell, chill 4 to 5 hours, slice, add whipped cream. My family always meets at my grandparents' house for thanksgiving, always eat our thanksgiving dinner around the big table. My grandparents, pictured here, JUST pulled the turkey out of the roaster, and are pulling the plastic lining off of the turkey filled with the most amazing stuffing you'll ever feast on (stuffing can be seen in front of my grandmother). To be honest, I have no idea what my grandpa is pointing at. And as far as i know, they stuffed the turkey with the stuffing (obviously), and plopped the turkey in the roaster and pulled it out a few hours later.